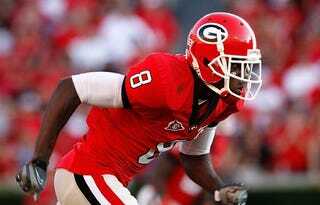 UGA's top receiver just got a four-game suspension for allegations that he sold one of his game-used jerseys. Meanwhile, let's take a look at what's for sale in Georgia's official team store. This isn't a big secret, of course; I just thought it would be fruitful to visualize it. So what's the difference between Green's big horrible violation, and all those jerseys for sale? A name on the back. Oh, and it's Nike, the school, and the NCAA that are making money on those.